Mark your calendars: The Challenge on Wheels kicks off February 21th! 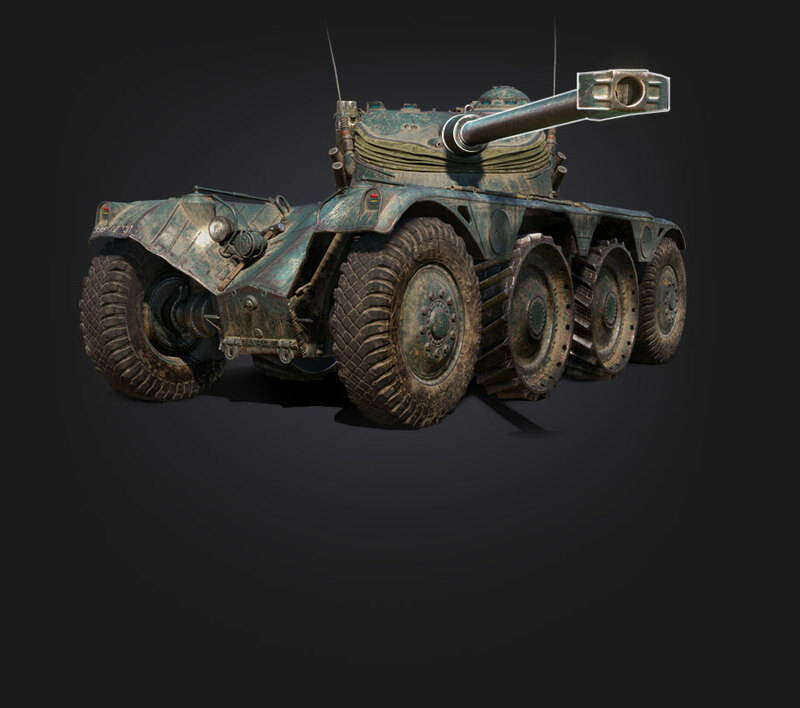 Complete it and you’ll earn yourself a unique Tier VIII Premium wheeled vehicle, the Panhard EBR 75. This Challenge is truly special and will let you experience taming a quick and agile scout. We know it's not going to be easy, but by the end of this event, you're going to get an outstanding vehicle, which you’ll show off with pride… and spark envy in other Commanders! The concept will be familiar to those of you who took part in last year’s Winter and British Challenges. However, this time about half of the Commitment missions will be close to the Mastery tasks in terms of complexity. We tried to find a kind of “equilibrium” and make them challenging, yet feasible. Check ‘em out! Earn a total of 3 000 base experience points. Only experience earned for being among the top-10 players on your team by experience earned is counted; can be completed in Tier VI-X vehicles only. Destroy at least 3 enemy vehicles 1 time. Cause at least 3 000 HP of damage. Only battles won when being among the top-10 players on your team by experience earned on Tier VI-X vehicles are counted. Earn at least 800 points of base experience 5 times. Earn a total of 15 000 base experience points. Cause at least 3 500 HP of damage 6 times. Be among the top-3 players on your team by damage caused. Only battles won when being among the top 10 players on your team by experience earned on Tier VI-X vehicles are counted. Earn at least 950 points of base experience 8 times. Earn a total of 30 000 base experience points. Cause at least 20% of the total amount of damage caused by your team 8 times. Earn at least 950 points of base experience 14 times. Be among the top-3 players on your team by experience earned. Be among the top-10 players on your team by experience earned 80 times. Cause at least 4 000 HP of damage 14 times. Destroy at least 2 enemy vehicles. Earn a total of 40 000 base experience points. Finish the battle as the top player on both teams by damage caused 14 times. Cause at least 3 000 HP of damage. Be among the top-10 players on your team by experience earned 90 times. Finish the battle as the top player on your team by experience earned 20 times. Earn at least 850 points of base experience. Earn a total of 45 000 base experience points. Finish the battle as the top player on your team by experience earned 20 times. Cause at least 2 500 HP of damage. This time you will have to tame a demanding and slightly unpredictable vehicle, as its fast maneuvering takes some getting used to. It may take a lot of effort to master the new mechanics and learn how to control this high-speed scout, but we're sure you'd love to know what it feels like to be a pioneer of entirely new vehicle type in World of Tanks! This is more than just another Challenge. You’ll enjoy an exciting and a difficult chase, full of risks and dangers, for a vehicle with unique properties. Yes, the timing is tighter than anyone expected and this Challenge is the biggest test of your skills so far, but the vehicle is definitely worth it! This legendary wheeled tank is entirely historical and was mass-produced until the 1970s. Its maximum speed is 80 km/h, both forward and in reverse - exactly what you need for active spotting and scouting. Learn to utilize its high speeds, and you’ll succeed on the battlefield. Mouse over the points to display the info on the vehicle. To go back to the main characteristics, click . The Panhard EBR 75 stands out not only for its speed. It demonstrates high combat effectiveness thanks to the 75 mm auto-loading gun with a two-round clip, dealing an average of 175 damage per shot. The gun is mounted on an oscillating turret. This combination will allow you to quickly reach the firing line, fire 2 shots on the move and then instantly leave your location. Plus, high armor penetration with HE shells will allow you to cause more damage to lightly armored adversaries. And don’t forget about their unique mechanics, exclusive to these vehicles — the lock-on feature and two driving modes. They will help you survive even the fiercest battles and successfully confront other vehicle classes. Just like the British Challenge, the chase for the Panhard EBR 75 will last 14 days, from 21 February at 10.00 to 6 March at 10.00, and involves completing 10 consecutive stages. There are two ways to earn this Grand Prize — choose the one that suits you best! Missions for commitment. The best option for players with a strong will. Task conditions will be diverse, but they can be performed using the Tier VI — X vehicles. Missions for mastery. The challenging and thorny path for more skilled players. Performing these missions will save you time, but in return will require maximum concentration and skill. This time, unlike previous challenges, you can perform these tasks using not only Tier X, but also Tier IX machines. So, this Challenge will be open up to a wider range of vehicles. Note: Both sets of tasks can be fulfilled simultaneously (given all conditions are met). Regardless of the path you choose, you get the chance to win tons of rewards along the way: Credits, Personal Reserves, and more! How Can I Get the Grand Prize Right Away? No time to complete all the missions? No worries, each of you has the opportunity to purchase the Panhard EBR 75 in the Premium Shop and it will be discounted 10% for each stage you’ve already completed. So, for example, completing 5 out of 10 stages will knock 50% off the price. Note: Purchasing the bundle gives you the full pack of rewards for not yet completed tasks and automatically checks all event battle missions as completed. So, you won’t be able to access them once you purchase the bundle. Take on the Challenge and park the unique wheeled scout in your Garage! ← Prev news: Frontline: Episode 1 Ends!